Ivory Coast striker Didier Drogba was named 2006 African Footballer of the Year, edging out Ghana's Micheal essien and Cameroon's Samuel Eto'o to deny the Barcelona marksman a record fourth successive award. Drogba, 28, took the honour for the first time after captaining his country to the African Nations Cup final where they were beaten on penalties by hosts Egypt. Ivory Coast also reached the finals of the World Cup for the first time last year while Drogba won the English Premier League with his club side. Chelsea team mate Essien finished third for the second consecutive year in the poll of Africa's 53 national team coaches. Last year, Eto'o pipped Drogba by two votes in the closest race in the award's 36-year history. Drogba turned the tables on Eto'o this time, securing 79 votes against his rival's 74. Ghana midfielder Essien polled 36 votes as coaches gave three points to their first choice, two to their second pick and one point to their third. Drogba's success came four days after he scored twice to help Chelsea beat Arsenal 2-1 in the League Cup final, taking his tally for the English season to 28 goals. The Abidjan-born striker spent much of his youth growing up in France where he played for Le Mans, Guingamp and Olympique Marseille before moving to Chelsea in 2004. 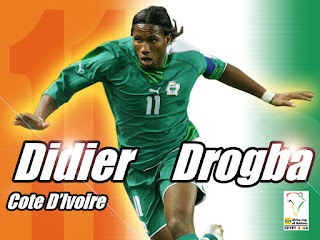 Drogba is only the third English-based footballer to win the award after Nwankwo Kanu, then of Arsenal, in 1999 and Senegal's El Hadji Diouf, who was with Liverpool when he took the title in 2002. Eto'o helped Barcelona to a Champions League-Spanish Primera Liga double last season and finished top scorer at the African Nations Cup finals. Essien, whose appearance attracted thousands to the city stadium in Accra, had an outstanding campaign as debutants Ghana reached the last 16 of the World Cup in Germany. In other awards on Thursday, Olympique Marseille defender Taye Taiwo (Nigeria) was named best young African footballer while Ghana were chosen as international team of the year. Egypt's Al Ahli took the club prize and their Portuguese boss Manuel Jose was coach of the year. Ghana marks 50th birthday...PHOTO ACCOUNT.